ThunderCats earned a place in the hearts of millions of children across Britain when it debuted in 1987. Regarded by many fans and critics in the UK as one of the best and most popular children’s shows to hit TV screens, it taught the Code of Thundera while supplying action, excitement, and adventure at a level previously unseen by UK audiences. Action-packed, fast paced and instantly addictive, ThunderCats set the benchmark for cartoons in the UK, remaining unsurpassed in popularity until the arrival of the Teenage Mutant Ninja Turtles (or Teenage Mutant Hero Turtles, as they were known in the U.K.) three years later. While it may be hard to believe, in many ways the UK is where the ThunderCats enjoyed its greatest success. In the US, the series appeared to be overshadowed by He-Man and the Masters of the Universe (still a dominant force on toy shelves when ThunderCats made its American debut in 1985), Transformers, The Real Ghostbusters, and a certain aforementioned quartet of shell-backed teens. However, by arriving in the UK two years after its debut in the States, ThunderCats was allowed to stand virtually unchallenged as the number one action-adventure property until the arrival of The Real Ghostbusters a year or so later. On January 2, 1987, ThunderCats debuted on BBC1 with the episodes “Exodus” and “The Unholy Alliance,” proving to be an instant smash hit with millions of children all over Britain. Where it was mostly commonplace for ThunderCats to be shown on various networks daily in the US, in the UK the anticipation for each new episode was greater because the show was broadcast only once a week. In the following months, as part of “Children’s BBC,” the UK was treated to the first 32 episodes of ThunderCats (the Anointment Trials were not shown). Then, the series went into Saturday morning repeats in 1987 through 1988, firstly as part of magazine programs “Going Live!,” “UP2U” and “On the Waterfront,” and then again as a stand-alone show in 1989. By this time, UK audiences could have been forgiven for thinking that ThunderCats‘ official series finale was “The Rock Giant”, for it was the last “new” episode of the show that the UK was to see for several years. Some episodes not broadcast by the BBC were released on home video by The Video Collection (most notably ThunderCats Ho! The Movie), but these episodes were very few. All of this changed on September 10, 1990, when ThunderCats returned to Children’s BBC with “Lion-O’s Anointment Day One: The Trial of Strength”. Over the course of the next few weeks, the remaining parts of Lion-O’s Anointment Trials were shown, followed by a repeat of “The Rock Giant” on October 15, 1990, and then continuing on with “The Thunder-Cutter” the following week. An interesting note about the return of ThunderCats to UK TV is how the censors’ attitudes towards Panthro’s martial arts action changed between 1987 and 1990. The first 32 episodes of ThunderCats shown by the BBC were virtually uncut, at least save for the editing of the fade-out at the end of Act 2 and fade-in at the start of Act 3 in each episode. Therefore, all of Panthro’s fight scenes were left intact, including those where he used his fighting sticks, which were modeled on the ancient Japanese weapon known as the nunchaku. However, by 1990, the arrival of the Teenage Mutant Ninja Turtles in Britain completely altered the view taken by censors towards the portrayal of martial arts in children’s cartoons. 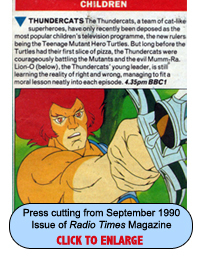 Before that series’ arrival in the UK, it had been subject to rigorous editing before censors would allow it to be shown in Britain – so, for all of the “new” ThunderCats episodes shown in 1990 to 1991, fight scenes involving Panthro using his weapon were also cut, not as aggressively as the Turtles’ cartoon, but enough to render the episodes incomplete in some cases. The season 1 episode “The Transfer” was never broadcast in the UK, and a likely reason for this could be the large amounts of nunchaku action employed by Panthro in the episode. 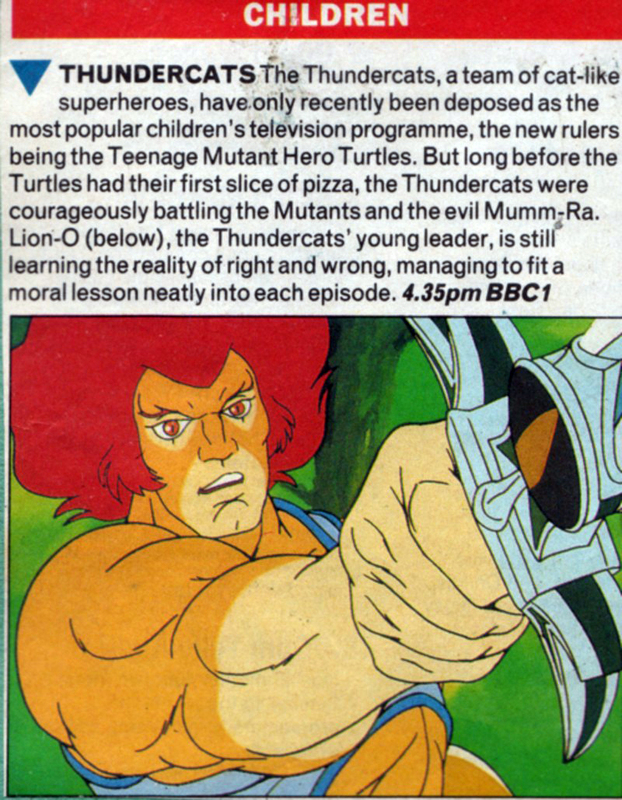 One wonders whether the long delay by the BBC in broadcasting the remaining episodes of ThunderCats may have been caused by the perceived need to edit them beforehand. The final “new” episode of ThunderCats to air in the UK was “Fond Memories” on May 20,1991. Sadly, with the exception of the home video release of “ThunderCats Ho! The Movie”, none of the remaining 65 episodes were ever broadcast in the UK. The second half of season one episodes went into repeats, again as part of “Going Live!” on a Saturday morning, among other times, then gradually dwindling away into obscurity. In 1996, a forthcoming satellite TV channel known as The Warner Channel was set to show ThunderCats every weekday morning in a block with Batman: The Animated Series – however, sadly the channel was dogged by legal problems, and failed to make it to air, denying ThunderCats to a new generation of young British fans. One can only speculate as to whether the elusive final 65 episodes would have been broadcast in the UK had The Warner Channel launched. Although Cartoon Network has so far resolutely resisted pleas to show ThunderCats in the UK, the show’s popularity remains strong. Thousands, if not millions, of young adults still look back fondly to a time when their lives were enriched by the adventures of Lion-O and the mighty ThunderCats being guided by the Code of Thundera. Let the magic live on!